These safety glasses are from the Classic range this Line characterised by a classic and sober design, which always satisfies the needs of protection and comfort of the users who prefer a more traditional style. Glasses endowed with 8-point bending lenses having a wide view field. They distinguish themselves not only for the sporty style, but even for the comfortable lightness. Nylon frame that fully covers the lenses and with a particularly enveloping form. End pieces and adjustable nose pad made of soft material with an excellent comfort. Soft ear pieces, situated at the end of the temples and made up of soft rubber, they reduce the pressure of the temples an the head of the operator, ensuring a better adherence and a greater comfort especially in the case of prolonged use. Soft nose pad, the soft rubber used for the nose pad improves the comfort of the glasses again adding to the prolonged use. Recommended for indoor environments with good visibility conditions and for indoor applications, where the protection of the eyes against impact and most common risks is recommended. Moreover, they help to protect against ultraviolet rays. Applications for the Clear Lens mechanical indoor work with good visibility conditions. 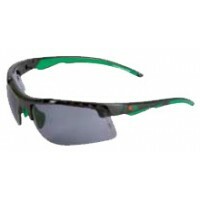 Cofra Armex Grey Safety Glasses with Grey Lenses anti scratch coating.